Good news: If you have tried to meditate without success, listening to music while you meditate may be the secret. And if you already meditate regularly, adding music can enhance the experience. For traditional meditation, you find a quiet place, remove as many distractions as possible—bright lights, cell phones, etc.—and focus on your breath or a mantra. 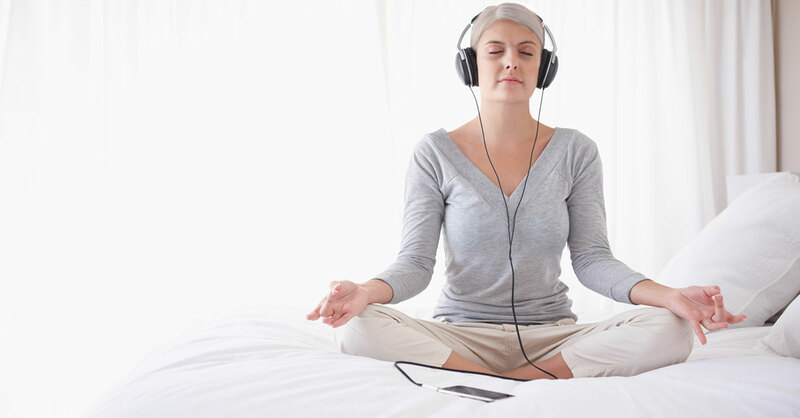 When music is added to meditation, it offers a new and enjoyable focal point. Instead of feeling pressured to concentrate solely on your breath or mantra, you can focus on the music. Classical music—This type of music has been proven to slow heart rate, boost memory and more. Choose slow pieces that are captivating but not bombastic, such as Pachelbel’s Canon in D, Bach’s Air on the G String from Orchestral Suite No. 3 in D Major and Mozart’s Piano Concerto No. 23, 2nd Movement, Adagio. There are many selections available for purchase online or streaming for free on YouTube or other websites. New Age music—There are lots of choices in this genre as well. An album I like is In a Silent Place by Eric Roberts. Irish music—Good choices include relaxing Irish and Celtic music and, my favorite, Watermark by Enya. Guitar and flute combinations—Various selections by Peder Helland feature guitar, violin, flute, cello and harp music. And on Music and Meditation (available at AmyZabin.com), I lead listeners into a deep meditation using guitar and flute music as well as crystal singing bowls. Note: In my opinion, meditating to music might not be ideal at night—while the process feels relaxing, music activates so many parts of your brain that the overall effect is invigorating…you’ll feel focused and alert afterward. Music meditation is best done in the morning or as an alternative to a midafternoon cup of coffee. To start, sit or recline in a peaceful spot, free from distractions—your bed, a couch or even in your car parked on a quiet street. Close your eyes and take a few breaths in through the nose and out through the mouth. Some people like to breathe in to a count of four and exhale to a count of eight, while others prefer to simply breathe in and out as deeply as possible. Tune into your body and how it feels—do you notice any areas of tension or tightness? Take notice of these sensations, then release them. You can try shrugging your shoulders and releasing them and rolling your head a few times to let go of tension. Next, turn on the music…you can play it out loud or use headphones or earbuds. Continue slowly breathing in and out as you turn your full attention to the music. Allow the music to lead the experience—to wash over, around and through you. Notice the tempo and the various instruments. Maybe you find yourself tuning into the cello in an orchestral piece or the ping of a triangle in a New Age song. Ask yourself—“How does this music make me feel?” Maybe it’s relaxing you all over, or you notice your chest opening up, or you find yourself smiling. If your mind wanders, that’s fine. Think of these thoughts as clouds passing through the sky—simply notice them without judgment and gently return your focus to the music. Interesting: Some experts believe the power of meditation lies in shifting and returning to focus. The more you practice it in the soothing, controlled environment of meditation, the easier it will be for you to calm yourself during stressful times. Remarkable: I’ve found that just three to five minutes, three times a week, is all you need to reap the rewards of meditating with music.